If you’ve successfully gotten past shortfalls in your budget, congratulations! You’ve learned to spend less than what you earn. You’re probably accumulating the money you save each month and perhaps thinking about investing them. Not so fast! Before you risk your money to an investment, it’s wise to build and set aside your emergency fund first. The usual practice is to save six months-worth of your expenses. You may keep this in your savings account or park it in a fund that’s fast and easy to withdraw. Why? Because if you invest all your money, you’ll be vulnerable during emergencies. Although you can withdraw your investments, it may take time to have the money back. You may be forced to withdraw at a loss or resort to borrowing money. So instead of earning from your investment, you end up losing more. But if you’ve already thought of that, you may now be deciding which investment to pursue. There are many options available. The stock market is one of them. Although investing in stocks is a risky business, it is possible to profit from it. That would entail careful study of how it works and how you can mitigate the risks. Investing in the stock market is a long-term proposition. But if you’re not convinced about its potential reward, you only have to see the chart below. 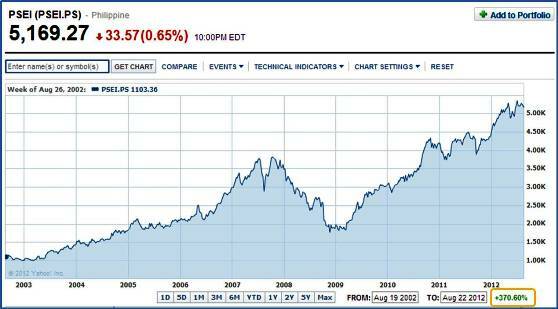 It shows the PSE index growing by 370% in a span of 10 years. There are indeed times when the stock market went down, but overall it performed really well. This does not guarantee future performance, however. It’s always smart not to put all your eggs in one basket. In other words, consider investing some of your fund somewhere else where the risk is lower. When you are ready to invest, it is worth knowing that you can now buy and sell stocks online. There are accredited stockbrokers operating in the Philippine Stock Exchange (PSE) that offer online transactions. Depending on which online stockbroker you choose, online transactions offer distinct advantages to you as an investor. 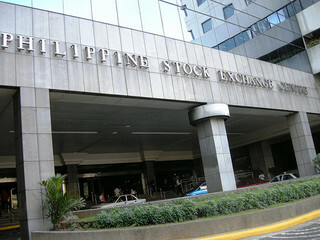 I have a list below of these online stockbrokers which are accredited by the Philippine Stock Exchange together with the link to their online sites so that you can check them out. I am currently a client of COL Financial so I can share with you my actual experience with them. I cannot say with certainty that COL is the best among this list but I did have an easy time using their online platform. The interface of COL online platform is easy to navigate with expert research and insights available for users to download. Market data are also updated which may be filtered to suit the client’s preference. I also appreciate the low commission rate of only 0.25% that they charge. It is the lowest allowable commission rate for stockbrokers. Other fees are also not that much for the transaction to be too costly. If you need an online stockbroker in the Philippines, just follow the links on the list above to know more about each of them.